Crooked Brook is offering a 15 % discount off mens or womens chef coat style #100 with embroidery or embroidered patches from 9/22/12 thru 09/29/12 with no minimum. Since 1989, Crooked Brook has designed, cut and sewn chef coats for the most recognized names in the noble art and science of gastronomy. 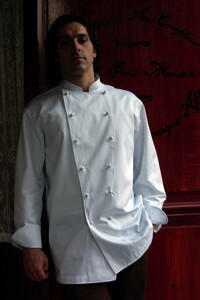 One of the most recognized brands in the chef wear industry; Crooked Brook ships custom chef coats worldwide. All Crooked Brook chef coats are made to order in the USA, and can be personalized with the customer’s choice of fabric, pockets, buttons, piping or embroidery. From 9/22/12 thru 09/29/12, Crooked Brook is offering a 15% discount off men’s or women’s chef coat style #100 made in any fabric, color or style option offered with embroidery or embroidered patches and there is no minimum. Logos are one of the most visual expressions of a company’s identity and one reason they are so important for creating a lasting impression of a business, product or service in the minds of everyone exposed to it. Logo embroidered chef coats convey an image of professionalism and have always been a great way to build brand recognition or to promote a product. Although embroidery or embroidered patches are the most popular method of decoration for chef coats, sometimes neither is suitable for a logo or design because more often than not, the artwork was designed for print. With print, letters can be much smaller and colors can be incorporated more fluidly than with embroidery. Therefore, in some cases, printed logos are a better option and a lower cost alternative to embroidery. After Crooked Brook reviews the customers design or logo, they will discuss which method of customization is best for their situation. Chef knives, custom and made to order men’s and women’s chef coats, casino, spa, resort, hotel, chef and restaurant uniforms as well as alumni chef jackets for the Culinary Institute of America. Custom and made to order men’s and women’s embroidered lab coats, uniforms and scrubs for nursing, medical, dental, scientific, engineering, technology & healthcare professionals. Sewing buttons and fabric by the yard: Ripstop, Organic Cotton Twill, Gabardine, Seersucker, Denim and Supima® Gabardine.